This photo was taken from my back garden looking towards the lights of Cambridge a few miles away. That's not the sun setting - that's low clouds reflecting all the street lamps, which are orange. 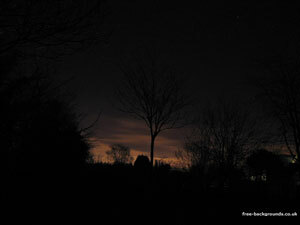 The silhouttes of the trees and houses are starkly black, except where some light escapes from a window. Further up the picture, away from the lights of Cambridge, some of the brighter stars can be seen.